WHEN, IN 1977, writer and director George Lucas released to astonishing critical and commercial acclaim the first of his opening trilogy of Star Wars films, science fiction fans across the United States devoured his dazzling space opera with feverish excitement. Throwing themselves head first into the burgeoning pop culture phenomenon, happily taking up a semi-permanent residency in a galaxy far, far away, rife fanaticism sparked by shared appreciation for A New Hope set in motion a chain reaction that would one day do away with all reticence and inhibition at the very core of nerdism, making being a nerd not just reservedly accepted but openly cool. But while it may have taken until the late-1970s for the catalyst that saw science fiction nerdism go nuclear, for as long as humans have stood in willing attendance as other humans kick balls between posts, another species of nerd has been positively flourishing for aeons, all the while hiding in plain sight. They’re known as football fans. 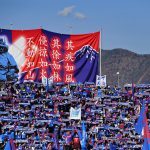 Though you may never have thought to acknowledge it, football fans – with their blinkered devotions and dogmatism, their unabashed insularity and in-jokes, their obsession with facts, figures and statistics, their penchant for matching attire and proclivity for voicing their shared beliefs in organised choral verse – are undeniably nerdy. As American author and football enthusiast John Green once said: “[Nerds] are allowed to be unironically enthusiastic about stuff. Nerds are allowed to love stuff, like, jump-up-and-down-in-the-chair-can’t-control-yourself love it.” While perhaps not directly referencing his fellow fans of the beautiful game, Green’s lucid description of ‘nerdy is as nerdy does’ inadvertently evokes a fitting image of every passionate football fan from here to Tatooine. But while science fiction and football both present unique opportunities for a temporary escape from the mundanity of the everyday – be them two unique avenues of escape that both see millions of reality’s conscientious objectors embrace with genuine unyielding passion – the truth is, Americans hesitate to throw their nerdy, no-holds-barred-obsessive selves at the feet of fledgling footballers in quite the same way they do their make-believe heroes simply because they have been burned before, let down once too many times by their misplaced sporting affections in ways that science fiction would never dare to do. Even so, there may still be light at the end of the warp tunnel. For those undeterred soccer nerds who can do nothing to stifle their dreams of a thrilling reboot to the USMNT franchise and a successful climax to their generation’s on-field anthology, a new hope may yet remain in the form of a talented, young, footballing padawan by the name of Christian Pulisic. Born just four months shy of the new millennium to two football-playing parents, Christian Pulisic’s place at the heart of the beautiful game always seemed to have more than a hint of inevitability about it. An ex-professional indoor player and esteemed coach for a father and a mother who excelled playing at university level, baby Christian might well have been born with a football already at his feet. But with the Pulisic family’s nomadic tendencies, the route by which their son journeyed in order to align himself with his seemingly predestined fate was a little less orthodox by comparison. Growing up in Pennsylvania, Christian’s parents insisted upon letting their son discover his own joys in life, unswayed by their own common interest. Nevertheless, whether by pure coincidence or simply at the whim of genetic predisposition, it took little time for Christian to follow in his parents’ footsteps, just like them willingly enticed by the allure of football. While it may have been on American soil that Pulisic’s small strides were first accompanied by the roll and tumble of a familiar spherical companion known so well to his folks, it was during a year’s stay in the English countryside that left them inseparable. With his mother Kelley having been offered a scholarship to work abroad on a teaching exchange, six-year-old Christian joined his parents in departing for England, where they settled in Tackley, a quaint, quiet village a few miles north of Oxford. While there, his father Mark happily took on the task of embracing his son’s growing love for the sport, enrolling Christian in the youth setup of a local team – sixth-tier side Brackley Town – all the while utilising spare evenings and weekends to embark upon an impromptu tour of the English leagues, taking his son to watch teams up and down the country for a ‘proper’ football experience. Though the family only remained in England for 12 months, the footballing education provided for Christian during this time, both on and off the pitch, proved invaluable. 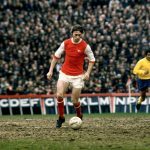 Playing at school, before school, after school, at the weekends with his parents, with his team in local tournaments, on assorted parks and playgrounds – anywhere and everywhere he could get it. Infatuated with the on-field freedom, a young Christian Pulisic fell in love with the sport in the most organic way imaginable and his parents could scarcely have been happier. When the three of them returned to America, Christian wasted no time in picking up immediately where he had left off abroad. Having moved to Michigan, while his father operated as general manager for indoor soccer team Detroit Ignition, Christian began playing for Michigan Rush, the local arm of a worldwide soccer program founded in the US. Before long, though, the family upped sticks again, this time to return home to Pennsylvania, and this change of residence once more prompted a change of club for Christian. His time in Michigan had provided the youngster with his first taste of competitive youth football in America and had reaffirmed the affections he first developed while in England. Now back in his hometown of Hershey, with both Christian and his parents eager to begin taking his football a little more seriously, with a view to a potential future in the game for their boy, Mark and Kelley enrolled their 10-year-old son in their local US Soccer Development Academy team, PA Classics. As a necessity, Pulisic developed a keen level of vision, anticipation, a speed in body and thought, and an unmatched creativity that elevated him far beyond those with whom he shared a pitch. As a result – it is unlikely Christian Pulisic will ever grow far beyond his current modest height of five feet eight inches – his relative lack of physicality will seemingly present little cause for concern as no on-field skirmish could possibly present a task any different to those he grew up facing, to those he made his name by conquering. During his seven years at PA Classics, Christian’s father would routinely take him abroad during the summers, on trips a little like scouting missions, that would have Christian temporarily join the academies of an assortment of European clubs, the likes of Barcelona, Chelsea, Porto, PSV and Villarreal, in order to glean from them whatever he could, to learn from their diverse teachings, to become acclimated to an array of environments and soak up the types of culture so unavoidably alien to those who remained solely at home. It was in part due to trips like these that Pulisic’s rise to stardom took place in such fashion. In the first instance, Christian’s doing something different helped him to be different. Sampling European football as often as the family’s schedules would permit, taking so many steps to remain outside of his comfort zone in the name of learning aided Christian in forging the necessary tools to surpass those around him. Almost as though each and every player across America were the same dish, all competing for a single place on the menu, Christian Pulisic’s travels, and the scholastic souvenirs picked up along the way, became the seasoning that helped him to stand out among the crowd. A unique and unforgettable flavour of football set against a sprawling background of indistinguishably bland tastes, Pulisic seemed destined to take the next step. When that next step arrived, his relative familiarity with Europe encouraged a boundless ambition that encouraged Pulisic to welcome with open arms the opportunity to follow his dreams across the Atlantic when, in 2014, German giants Borussia Dortmund came calling to the teenager. With the club’s interest in their son concrete, the family travelled to west Germany to gain an impression of what their son, and by extension their family, would be signing up for. Though some 6,000 kilometres from Pennsylvania, Christian and his parents were made to feel right at home in Dortmund, so much so that the next time he and his father arrived in Germany it was to stay for good. Helped greatly by his European heritage, Christian was able to smooth his transition from the US to Germany with a swiftly acquired Croatian citizenship – courtesy of his Croatian-born grandfather, Mate, from whom Christian received his middle name – and with still weeks to go before his 16th birthday, Christian made his move from PA Classics to Borussia Dortmund official. “I’m ready for this new challenge,” Christian declared, upon announcing his move abroad. “It’s going to be tough, but I think I’m up for it.” His words would prove to be quite the understatement. Given his young age and inexperience, both parties anticipated Christian’s slow and studious progression, a journey that would begin in the Dortmund youth setup and be intermittently punctuated by gradual promotions through the under-17s, under-19s and under-21s, with the intention of each step ultimately prefacing an eventual ascension into the senior team. Something of a five-year plan, common for a player like Christian. But he soon showed there weren’t many quite like him at all and quickly put to the sword any ideas of a slow and studious progression. On 17 April 2016, just 14 months after first turning out for the club’s under-17s, Pulisic was celebrating becoming the youngest foreign goalscorer – and fourth-youngest goalscorer of any nationality – in Bundesliga history after giving his side the lead at home to Hamburg, aged just 17 years and 212 days old. His rapid rise to the forefront of his new club was meteoric. For Borussia Dortmund’s under-17s the boy hit the ground running, notching six goals and five assists in his opening eight fixtures. From here the Dortmund hierarchy saw fit to waste no time in promoting him to the under-19 and he quickly rose to the challenge in the next age group. Despite being one of the youngest present, Pulisic continued to stand out, his fine form rewarded with four goals and three assists spread across just seven games for the under-19s. During this time, Pulisic also represented his country, to whom he was no stranger, captaining his side at the 2015 FIFA Under-17 World Cup in Chile. While on international duty, during an ultimately disappointing competition for the US, he conspired to provide yet more evidence of his being one of the United States’ most exciting young players as, in a momentous game against Croatia of all nations, Pulisic grabbed a goal and an assist. Before the turn of the new year, his growing influence for both club and country impossible to ignore, Borussia Dortmund manager Thomas Tuchel opted to remove Pulisic from the under-19s and call him up to the senior squad in time to join the team on their winter break training trip to Dubai. There the youngster would show sufficient cause for his continued inclusion in the squad after the resumption of the league campaign and would soon be afforded a first addicting taste of first team action. On 30 January 2016, his debut came at home to Ingolstadt, entering the fray with a little over 20 minutes left to play, before a packed Westfalenstadion reverberating to the sound of no fewer than 80,000 singing voices. With the score 0-0 when he arrived on the field, his team ran out 2-0 victors. 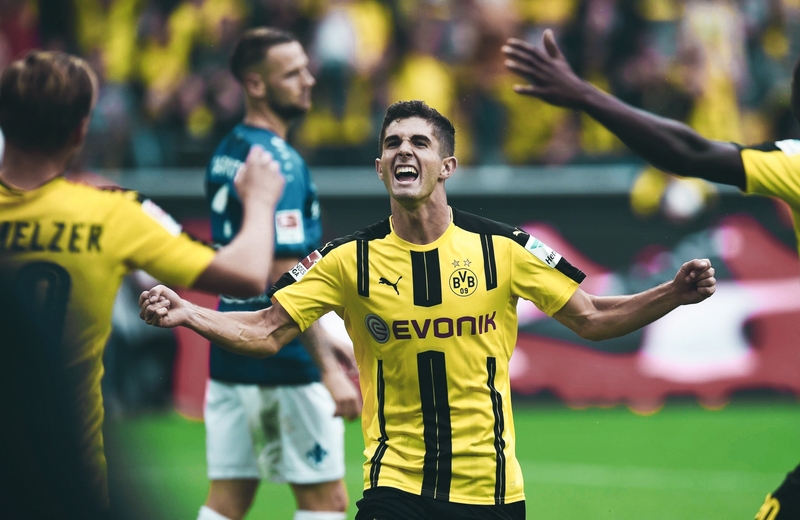 The black and yellow touchpaper lit, the records soon began to tumble at Pulisic’s feet: 17 April 2016, a goal against Hamburg; Pulisic the youngest non-German to score in the Bundesliga. Six days later, on 23 April, a goal against Stuttgart; Pulisic the youngest player ever to score two Bundesliga goals. On 14 September 2016, a man of the match performance on his Champions League debut against Polish opponents Legia Warsaw; Pulisic the youngest player ever to represent Dortmund in European competition. The weekend after his Legia masterclass, on the eve of his 18th birthday, Pulisic was on hand to score a goal and handcraft two others in a 6-0 destruction of Darmstadt. Ten days later, back in the Champions League, Pulisic left the bench in order to put on a plate for André Schürrle an equaliser against Real Madrid in a hard-fought 2-2 draw. The following month, finding themselves somehow 3-1 down to the league’s basement dwellers Ingolstadt, Pulisic proved instrumental in his side’s success once again, joining the action late on from the bench before scoring and assisting to salvage a valuable 3-3 draw. Such was the speed of this flurry of landmark contributions, so fleeting were the key moments in the games, Pulisic would be forgiven for failing to recall with any kind of clarity a single one of his finest early moments in Dortmund. Fortunately the records provide – for posterity – proof to those lost in the majestic whirlwind of it all exactly what an impact the young man had. But Pulisic’s record-breaking didn’t stop there. In addition to his growing collection of club-level accolades, Pulisic also managed to rattle off an incredible string of international records in the space of just six months – between late March and early September 2016 – becoming his country’s youngest ever player to feature in a World Cup qualifier, start a World Cup qualifier, score for the United States in the modern era;,score a goal in a World Cup qualifier, and score a brace for the United States. Though perhaps mere formalities, one day destined to be broken all over again, each new record claimed by Pulisic added to the allure of his astounding arrival and underlined his credentials. As he nonchalantly ticked them off as though they were daily duties on a to-do list, like post-nominal letters alluding to his increasing influence, his records helped to ensure the name Pulisic quickly entered the household vernacular of every football fan from Connecticut to California. But given the exploits that were still to come, it seemed there needn’t be any reason why the rest of the world shouldn’t also come to know the name Pulisic. 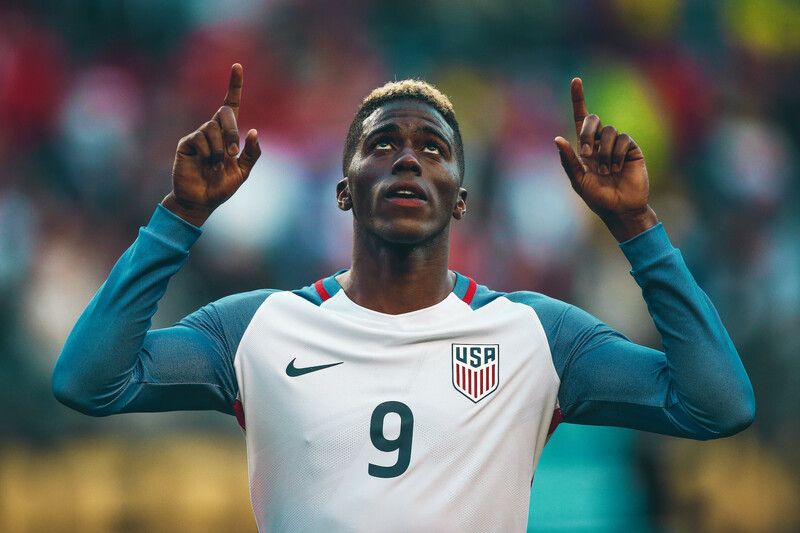 On the evening of 8 March 2017, once again sat against a pulsating landscape of coalescing yellows and blacks, confined between the four walls of the stadium that now most closely resembles what Pulisic calls “home”, the young American masterminded the greatest accomplishment of his burgeoning career thus far. With his Dortmund team having succumbed to a tough 1-0 defeat in the first leg of their Champions League round of 16 tie away to Portuguese champions Benfica, BVB invited their opponents back to their own turf for an evening of light revenge. By the game’s end, the headlines would eventually belong to Pulisic’s defence-terrorising team-mate Pierre-Emerick Aubameyang, for whom a hat-trick did the honours, but Pulisic would add his own name to the history books that evening and announce on the grandest stage of all exactly who it was generating that almighty buzz across the pond. With the score at 1-0 on the night and tied at 1-1 on aggregate, Dortmund poured forward in swathes in search of the goal that would put them ahead. In the 59th minute, full-back Łukasz Piszczek swept a low ball into the area, searching in hope for a willing runner, which it found in the form of Christian Pulisic, not for the first time invading Benfica territory with an idiosyncratic grace. Without time to think, insufficient space in which to steady himself with a touch or seek out support, all Pulisic could do was trust his finely-tuned instincts and hope to find the net with his very first touch. This is exactly what he did. With the deftest of right-footed chips, lofting the ball gently over the onrushing goalkeeper, Pulisic put his Dortmund team ahead and, at 18 years, five months and 18 day old, became his club’s youngest ever goalscorer in European competition. Together, he and his team-mates marched on with purpose towards the Champions League quarter-finals; further history awaiting Pulisic’s inevitable input. In the sure to be thrilling tale of Christian Pulisic, a story today still so young it is but only setting the scene, it is a refreshingly riveting reality that is unfolding before the eyes of the American people. Whereas in the past players on the cusp of national adoration have consistently shone on home turf only to be found wanting on foreign soil, or have had their great potential so overwhelmingly oversold that the heaviness of their country’s expectation has weighed terminally on their careers, Pulisic seems somewhat immune to these typical failings. Not only is it on famed foreign turf that Pulisic first began making a name for himself in professional football at all, vaccinating him against the first of the two most common American ailments, but his rapid ascent to heights rarely before scaled by American boots took flight so quickly that even the hype surrounding the player failed to keep up, meaning Pulisic rather swiftly became capable of more than even his ever expectant compatriots could imagine. Now, instead, it is his fast growing legion of fans being made to keep pace with the player. 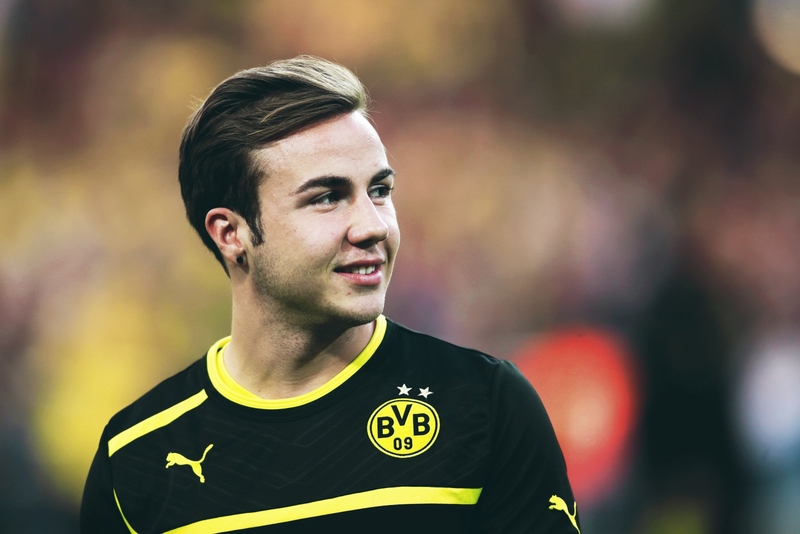 Performing alongside the brilliantly bright attacking flair of Marco Reus, Mario Götze and Pierre-Emerick Aubameyang, and with the opportunity to perfect his trade while becoming ever more accustomed to the Bundesliga’s breakneck speed alongside fellow wunderkinds Julian Weigl, Emre Mor and Ousmane Dembélé, it is hard to believe there could be anywhere better in the world for Pulisic at this very moment. Surely such serendipity can only bode well for the future. For some time now the United States of America have been calling out desperately for a genuine footballing icon to unite the nation (Landon Donovan, for all his quality, still divided many); somebody to break the mould, lead the charge and embody the passion, spirit and abundance of ability this new age of football America is so keen to indulge. So it should be, in perhaps the most fittingly American fashion possible, the boy with family ties to Croatia, whose love of football blossomed in England, and who is currently terrifying defences in Germany, may just be the player they’re looking for.